Ai teaches students to play musically and to communicate musical intentions to the audience. She develops the students’ technical facility, helps students achieve a more expressively open focused tone and tone colors, and shows students how to effectively apply technical skills to achieve musical effects. Ai also addresses posture, ergonomics, and body awareness as she believes that the performer’s body is an extension of the flute—one must learn to "play" the body as well as the instrument in order to make the flute sing and deliver the music to the audience. Students will learn performance practices for performing in Baroque and Classical periods, and build a wide range of repertoire from ancient to modern music. Ai is committed to sharing the skills and passion for music and flute playing with budding musicians of all ages and levels. 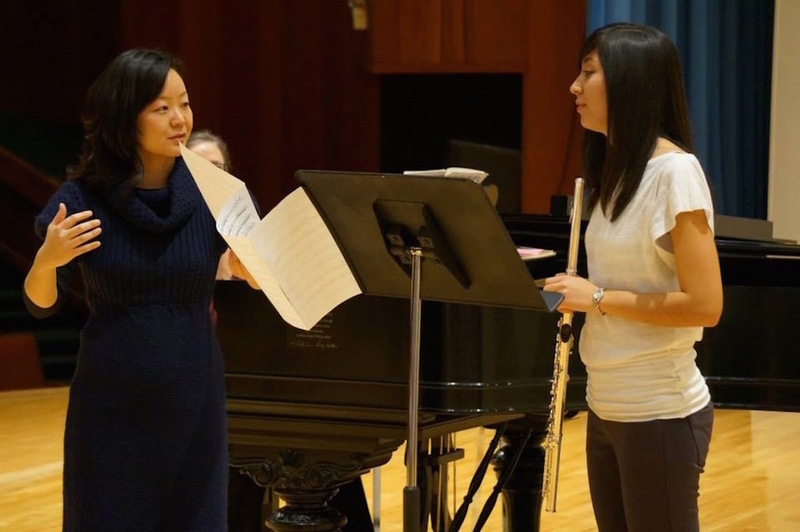 She currently provides private flute instruction in Cupertino, California, attracting some of the top-performing students in the area. As a testament to Ai’s effectiveness as a teacher, her students earn recognition as concerto competition soloists, competition winners, awards and distinctions at such as principal flutist of California State Honor Orchestra and Bands, principal flutists of youth orchestras and school ensembles, receive Superior and “Command Performance” ratings at CMEA festivals, etc. Ai’s intermediate and advanced students volunteer for the concert organization Encores On Wheels, through which they share their excitement and joy for music with the community throughout the San Francisco Bay Area. Ai is invited to adjudicate auditions and competitions, including the National Flute Association, Kentucky Flute Festival Young Artist Competition, Santa Clara County Honor Band, MTAC VOCE competition, and the Areon Flutes Summer Flute Institute. She also gives clinics, presentations, sectionals, and masterclasses by invitation, such as by Middle Tennessee State University, Western Kentucky University, Canadian Flute Convention, the MTAC Santa Clara division, MidSouth Flute Society, etc.